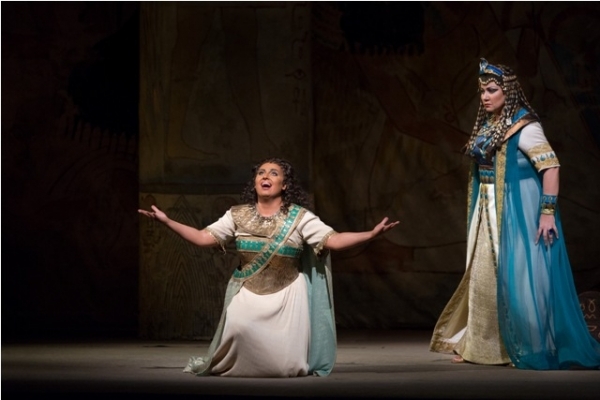 Nearly every year the Met schedule contains innumerable performances of Aida. This being a difficult-to-cast opera that sells without big names, the singing is often not that great (Latonia Moore’s Aida last season was an excellent exception, though I heard her only on the radio). This year the Egyptology made the HD broadcast schedule, and for two performances in the run–the broadcast and the one before it–the cast aligned into Liudmyla Monastyrska, Roberto Alagna, and Olga Borodina, what you could possibly call an all-star Aida. Unfortunately it ended up being a little too cautious to be exciting. Verdi, Aida. Metropolitan Opera, 12/12/12. Production by Sonja Frisell, conducted by Fabio Luisi with Liudmyla Monastyrska (Aida), Roberto Alagna (Radames), Olga Borodina (Amneris), George Gagnidze (Amonasro), Stefan Kocan (Ramfis). Of course another factor was Mr. Smooth, Fabio Luisi, on the podium. On the one hand, he doesn’t go for cheesy bombast and always keeps things moving swiftly. On the other an Aida that sounds more like Mozart is, outside a few of the more ethereal moments, not very exciting. This was, as always, professionally done, with Monastyrska particularly tuned in to his work. (Some of the other singers, not so much, which I will get to shortly.) The orchestra was fine, as was the chorus, but it was all a little too held back to be fully involving. Soprano Liudmyla Monastyrska has risen to the big leagues almost overnight and it’s easy to tell why. She’s got the killer combination of tremendous volume, solid technique, and decent musicality, and made real music out of a part that is often struggled through. The voice is more notable for its volume than its beauty, but she varies the color more than many in her fach. What she lacks, so far, is a personality as big as her voice, and a sense that she is making the role her own. Still, she was rock-solid, untiring, and the favorite note of Aida-fanciers, the high C in “O patria mia,” was impeccable. Olga Borodina got a fair amount of grief for this Amneris from other audience members, and I agree that like Alagna she is past her strongest years. The high notes are perilous and the high Bs in the Judgement Scene were cut off abruptly. But I found a great deal to enjoy in her singing; the rest of her voice has incredible depth and richness. And she was more engaged and animated than some of her colleagues. Finally, bug-eyed baritone George Gagnidze provided his usual reliable villainous snarling. The guy is not exactly a star–there’s not a lot of vocal glamor there–but damn if he doesn’t always get the job done in fine style. Supporting roles were on the underpowered side. The production, well, on the bright side, I’m glad they’re now using way less blackface than they did on this old video of it. And Alexei Ratmansky’s dances, an addition from a season or two ago, are a good cut above average (though the execution left something to be desired). But overall the thing looks like a costume party in the Met Museum where everyone is doing the Ancient Egyptian equivalent of Civil War reenactment. It’s too familiar and clichéd to be more than mundane, and not over the top enough to be fun. Time for a new production here, I think. Should the budget not allow, I have an idea. Inclined to agree with Edward Said that this opera represents the authority of Europe’s vision of Egypt of the 1860s, I suggest finding a Verdi lookalike, putting a pith helmet on his head, give him a sheaf of manuscript paper and a shovel and set him loose on this production. For once it would kind of make sense. Photo copyright Met (no name attached). This is so funny I burst out laughing: "But overall the thing looks like a costume party in the Met Museum where everyone is doing the Ancient Egyptian equivalent of Civil War reenactment."